Sweet and fruity on the nose with cherries, raspberries and red berries, complemented by a delicate red wine aroma. This is all wrapped in pleasant peat smoke. Sweet and strong on the palate with rich red wine flavours. Again sweet and delicate notes of cherries, red berries and raspberries, followed by sweet barley sugar. Warming spices arrive with cinnamon, pepper, nutmeg and spiced oak, mixed with a slightly sour touch of red currant towards the finish. The finish is long, warm and creamy sweet with red fruit compote. Becomes slightly dry on the tail with oak, tannins and peat smoke. Water enhances the fruitiness on the nose with more red berries, cherries and raspberries, while the red wine flavours are tamed. Sweet and creamy on the palate with toffee and stewed cherries and a slightly warming touch of spiciness. The finish is still long, slightly warm with red fruits. Becomes very dry on the tail with oak, lots of tannins and peat smoke. A fairly powerful blended malt. 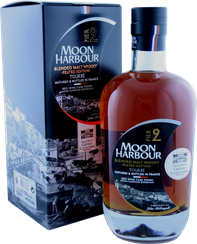 This luscious combination of sweet red fruits, warming spices, peat smoke and tannic dryness is satisfying nose and palate equally. The Château La Louvière red wine cask finish brings in delicate fruitiness and opulent sweetness harmonizing well with the peaty character of this blended malt. Best to enjoy in front of a fireplace. I thank Mr. Whisky Michael Reckhard for the sample and photograph!